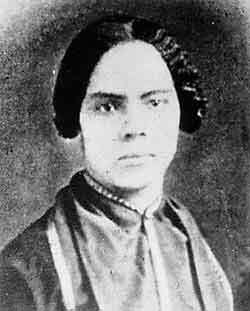 Mary Ann Shadd was born on October 9, 1823 in Wilmington, Delaware to a large family (thirteen siblings), later moving to West Chester, Pennsylvania. In 1833, her father, Abraham Shadd, sat on the board of the American Anti-Slavery Society. In 1840, after a Quaker education at Price’s Boarding School (1833-1839), she returned to Wilmington to open a school for black children. In 1849, she wrote Hints to the Colored People, a pamphlet urging African-Americans to rise against slavery, with or without the support of their Caucasian brethren. But her life changed when the US government passed the Fugitive Slave Act in 1850. She joined her brother Isaac and moved to Windsor, Canada to stand shoulder to shoulder with the many fugitive blacks slaves had quickly escaped before the new federal law could be enforced. In Windsor, she again established a school but this time, integrated. She also started the Provincial Freeman, a weekly newspaper dedicated not only to attracting African-Americans to immigrate to Canada but also to criticizing some of her fatalistic African-American sisters and brothers who she felt were not doing enough to stop slavery. "The first colored woman on the American continent to establish and edit a weekly newspaper." In 1852, she published a 40-page booklet, Notes on Canada West in an attempt to contradict anti-Canada propaganda being distributed by pro-slavery agents in both Canada and the USA. "Hundreds of miles away, people read Shadd’s reports of crop yield, terrain, climate, soil, timber and the virtues of integrated churches and schools. She rallied their attention with statistical and tangible evidence of Canada’s glory." Her biggest concern was well-intentioned organizations which promoted freedom for African-Americans but under the auspices of segregation. Cary was particularly outspoken and heaped aggressive insults on the targets of her attacks using words such as moral monsters and petty despots. She married Thomas Cary in Chatham, Ontario in 1856 and they had two children before he died in 1860. The anti-slavery zealot John Brown visited Cary in Chatham in 1858. The Freeman failed in 1858 and in 1863, Mary Cary returned to the United States of America, settling in Washington, again opening a school for African-American children. When the Civil War broke out, she enlisted as a recruiting agent and was sent to Indiana to recruit Black soldiers to the Union cause. At her graduation, she stood along with three other women in receiving her law degree. She opened her own law firm in Washington and fought for the right to vote. After a well-received speech she gave at the National Woman’s Suffrage Association annual meeting in 1878, she started, in 1880, the Colored Women’s Progressive Franchise Association. "She gave advice to humanity but failed to see that her bulldozer bluntness alienated people." But Mary Cary was ahead of her time. Lesser mortals might have succumbed to abolishing slavery in exchange for a policy of segregation, but not Mary Cary. She saw it for what it was: less than equal. Commire, A. and Klezmer, D., Women in World History: A Biographical Encyclopedia (London: Yorkin Publications, 1999), pages 469-470. Hine, D. and others, Black Women in America: An Historical Encyclopedia (Indianapolis: Indiana University Press, 1993), pages 224-226. Note 1: Women in World History states that Mary received her law degree form Howard University in 1870; but Black Women in America as well as Lesser Known Women give the date of that degree as 1883. The latter seems more likely although if it was 1870, that would make her one of the first woman or African-American of either gender to do so. See, for example, Belva Lockwood.